An overview of the game and kickstarter project. After a few plays of the game, I can say that it is quite surprising how the strategy sneaks up on you in the game. The components in the game are very well done, although it would be nice if the player mats were made of a sturdier material, as both of the players in our house have large hands and tend to bend up card stock pretty well. There is very little setup to do, and play moves quickly, with little downtime. The rules and design make it very clear who moves next and where everybody stands in the game. Once players begin taking advantage of stealing discoveries from each other, then things get quite fun! The random card (or two) dealt for each round adds an element of randomness to each game. 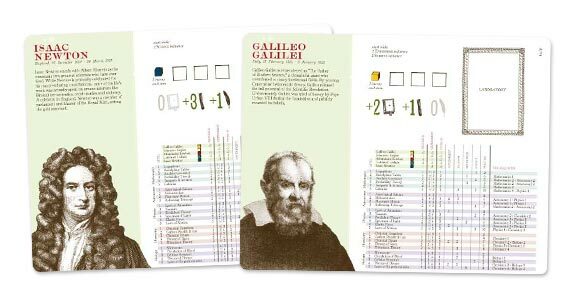 The main element of the game is to spend your time making discoveries through science, which through research, experimentation, and finally publishing, lead to earning victory points. You can “steal” discoveries away from others by beating them to the publishing stage, and some strategy comes from how to spend your precious energy each turn. The theme is very interesting, and although it enjoy how atypical it is, it may not be for everybody. Taking on the roles of major Enlightenment scientists is not going to appeal to everybody. This is a strategy-light worker placement game that most casual/serious gamers should give a look at, more so if you find the theme engaging. 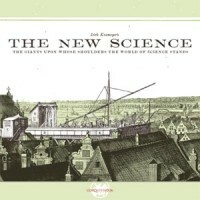 Add a Review for "The New Science"